Steve and Michael have a lot to be happy and proud about. 'Hunger' debuted in Belfast the other day and there were no protest or troubles. Red carpet protests never materialised at the premiere of controversial film Hunger last night. The film chronicles the last days of Bobby Sands and the other republican protesters during their hunger strike at the Maze prison. Heading up a cast of Irish actors, Michael Fassbender, who plays Sands, was proud to be back in Belfast to give the film its first showing. He also hopes the film, which won the Cannes Camera d’Or, will be a boost to his career. 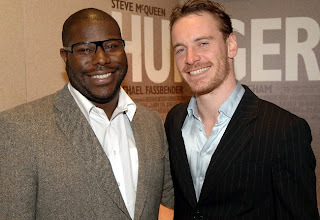 Hunger is the first outing for director Steve McQueen who is better known for winning the Turner prize for his video art.